One of the most asked questions I get as a stylist is from Mums who just don’t know what to do about the ‘style vs comfort’ dilemma . I truly believe that you do not have to sacrifice one for the other and there is most definitely another way than reaching for the same old pair of leggings and tank top you have come to know and love. It’s time to think outside the box, slightly, not too far though. I know that most of us have exactly 15.5 seconds to get dressed in the morning with all sorts of commotion happening around us, so dreaming up stylish, yet comfortably acceptable park wearing outfits are not high on the priority list. So, I’ve broken it down for you in this post. Keep it simple. Don’t freak out. Start with the basics and build from there. Basics – Let’s begin with the age old white (can be substituted for grey or black) tee and trainers. They will never look bad, they go with everything, and you can mix and match them with almost anything else in your wardrobe. If that’s not a win/win – I don’t know what is! 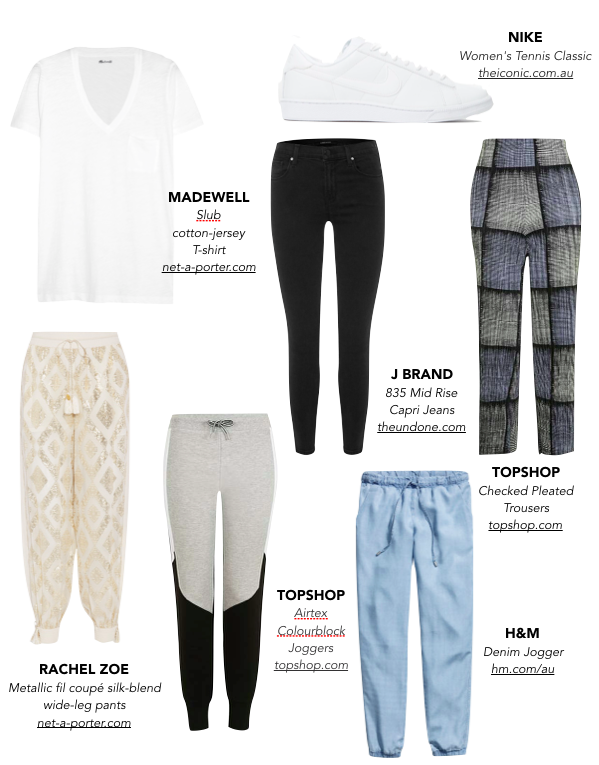 Pants – This post is all about the pant. The pant is your friend. Being a mum of 2 boys, I have to get into the most questionable of situations like looking for lizards under bushes, jumping on trampolines, sliding down the wee (that’s what my 2 year old calls the slippery dip…) riding scooters, jumping in puddles, you get the idea. It’s not glamorous, and it most definitely does not call for designer heels or a fancy dress. This is the trenches people – so like I said, pants are our friend. Comfort does not mean ugly, oversized or old – HA! If you are still wearing the tracksuit pants you wore during your pregnancy (and your kids are 7 and 9) it’s time to let them go!!! Time for an upgrade. I promise you there are fancy pants that feel just as comfy as your fleecy’s, but they look soooo much better. Affordable – the magic word! You most definitely do not have to spend your life savings to be comfy and stylish. A few key pieces will get you though!